Mother’s Day is a special day…it became even more special for me 23 1/2 years ago when I became a mom. My family spoils me, that’s for sure, and they always do something special for me on Mother’s Day. The trouble for me is that almost four years ago, Mother’s Day changed for me when my mom passed away. We were very close and I miss her like crazy every day, so Mother’s Day just doesn’t have the same shine for me anymore. I finally decided this last week to try to do some scrapping with some photos of my mom. I really enjoyed it and I have decided to do more. I made this layout with the Maggie Holmes Open Book collection…I love that line and all things that Crate Paper makes. I have been hoarding this collection and it is just perfect for these vintage photos I chose for the layout. 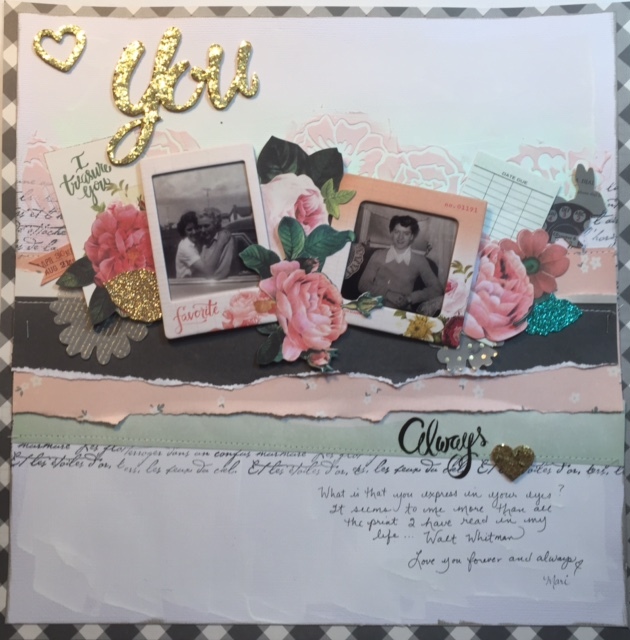 This layout is exactly why I love to scrapbook! I am able to document stories that are meaningful and the process is totally cathartic. When I am stressed, I love to scrap…but I love to scrap when I am not stressed, too 🙂 It is such a wonderful craft!! I used mixed media on this layout, including acrylic paint, texture paste, stamping and stenciling. I did a little bit of sewing on the layout, too. The papers and embellishments are all from Maggie Holmes Open Book by Crate Paper.